The Big One came early for Brad Keselowski in 2019 Speedweeks at Daytona. Brad was a contender to repeat as champion in the Advance Auto Parts Clash for most of the afternoon on Sunday. But after a restart (which followed the second rain caution of the day) left the No. 2 back in the middle of the pack, he found himself in the wrong place at the wrong time. A huge chain reaction wreck, starting at the front of the field, swallowed up most of the contenders in the annual 75-lap exhibition race and brought a permanent halt to the day’s proceedings as once again, rain started moving into the area. All told, 17 of the 20 cars in the field were involved in the wreck, including the No. 2 car. Brad was running P10 when a move by eventual race winner Jimmie Johnson spun then race leader Paul Menard, triggering an accident that rippled through the field. BK nearly made it through the wreckage unscathed until the spinning No. 18 car of Kyle Busch moved up the track in front of him. 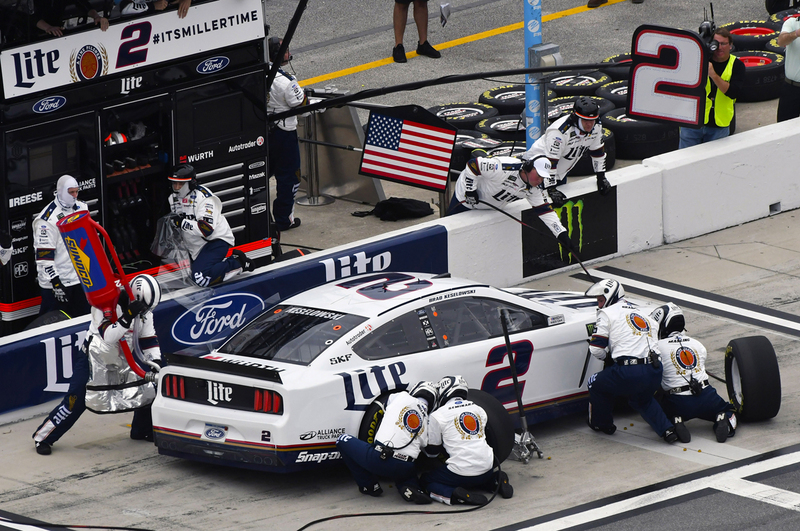 The Miller Lite Ford Mustang suffered severe front end damage and would likely not have been able to finish the race had it gone on. But once the caution came out, with rain once again falling, NASCAR decided to end the race with 20 laps to go, awarding the win to Johnson. Brad was credited with an 18th place finish. The finish was a stark contrast to the start, which had BK in P3 after a random drawing. From there, Brad and the No. 2 car pushed Paul Menard and the No. 21 to the lead, and though an opportunity to perhaps make a pass presented itself a couple laps in, BK settled into the second spot behind the Wood Brothers No. 21 machine. That’s where the 2 sat when the first caution came out at Lap 8 for rain, a recurring theme throughout the afternoon. During that break, Brad jumped on the radio with Fox Sports’ Darrell Waltrip and explained his decision making early in the race. 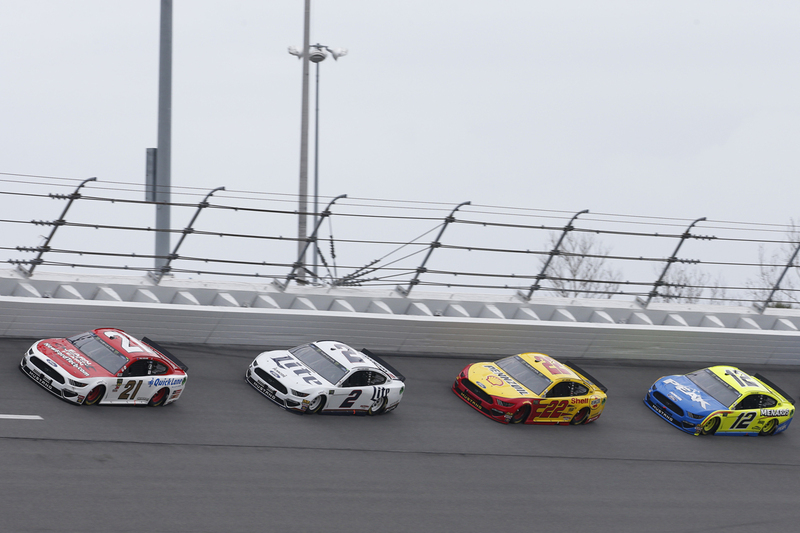 Brad and his fellow Penske drivers did control the race for the most part, running as the top four cars in the field after a 21-minute red flag due to rain. The No. 2 was second through that run, and pitted with the leaders at Lap 25, right before the NASCAR mandated caution. He took right side tires and fuel on his only pit stop of the day and restarted in P4. Once again he worked with Menard, with the No. 11 of Denny Hamlin sandwiched between them, until another caution for rain came just past the midway point of the race. Running P3 at the time, Brad was stuck on the inside lane when the race finally went back green with 28 laps to go, and with Menard on the outside picking up speed, and a strong line behind him, The 11 car of Hamlin and BK’s No. 2 dropped from second and third respectively to outside of the Top 10. 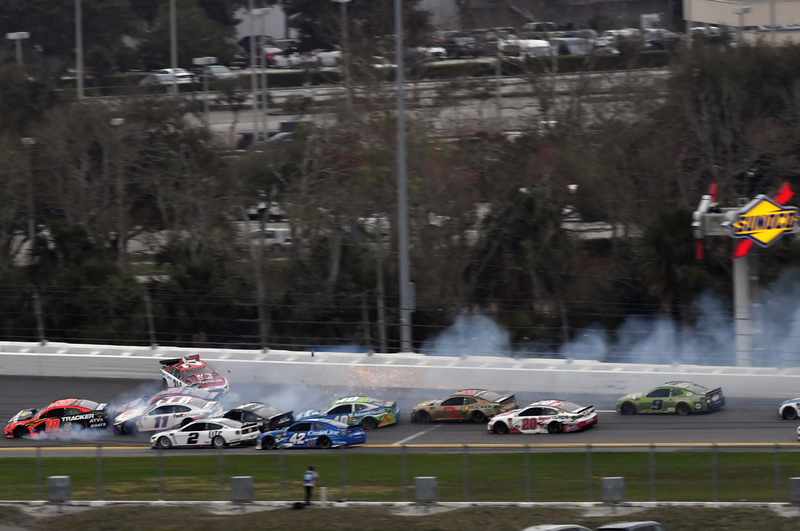 Try as they might to pick up speed and gather cars — including Brad’s teammate Joey Logano — to form an inside line, the group could never make a strong run to the front. Instead, with rain in the offing, it was left to Johnson to force a move, and when he did, calamity came in the form of the race-wrecking accident. Brad and the No. 2 team now turn their focus to the upcoming Daytona 500, for which they still have to determine where they’ll start. That will be decided by Thursday’s Gander RV Duels at Daytona. BK’s ninth-place performance in Sunday’s Daytona 500 qualifying session locked him into Duel 1, which he’ll start from Row 3. The first of two Gander RV Duels is set to begin on Thursday night at 7pm ET on FS1 and MRN. Cool just don’t over think things,let it flow and you can get it.500 trophy waiting.